This tutorial covers password modification, how to disable a password, how to change the length of a Windows password, and how to meet complex password requirements like minimum length, etc. What to do when the password you typed does not meet the password policy requirements. Checking the minimum password length. How to fix error: Password must meet complexity requirements or the password you typed does not meet the password policy requirements? Step 1: Go to Start Menu, Type "Group Policy" (without the quotes) in a search box. Click on "Edit Group Policy". Step 2: Go to "Computer Configuraiton" >> "Windows Settings" >> "Security Settings" >> "Account Policies" >> "Password Policy". 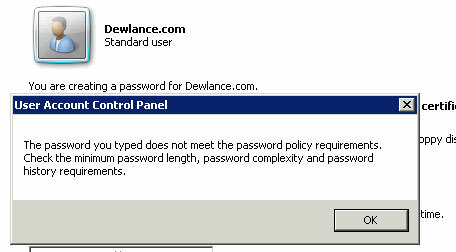 Double click on the "Password must meet complexity requirements" and select the "Disabled" option. Now click on "Apply" and then on the OK button. Congratulations, Now you will not receive the Password complexity requirements error. Modify Windows VPS Minimum password length. Follow Step 2 by going to "Password Policy" and double click on the Minimum password length. If you want to set the length, then set the number of characters in the box or should you want to disable the minimum password length, enter "0" (without the quotes) and click on "Apply". Modify the minimum password age in Windows VPS. Open Password Policy, by goint to "Minimum password age", and Enter "0" for disabling this option. Otherwise, enter the number of days like 100 days, etc. 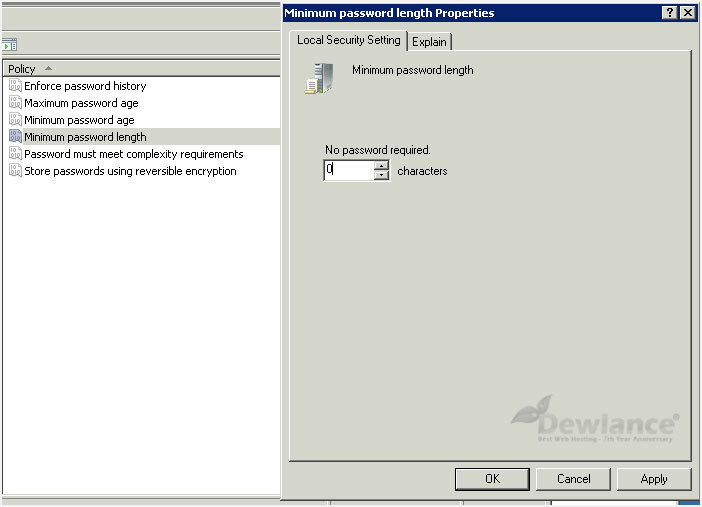 Disable Maximum password age in Windows VPS. Follow step 2. Open "Password Policy". You can not only modify the minimum password age but you can also enable or modify the maximum password age as well. If you want to disable the maximum password age, enter "0" in the Maximum password age section and then click on the apply option. Do you want to keep password history or disable it? You can disable the password history option by entering "0" as option or should you want to keep it, then enter a number in the box, like "5", to keep the last 5 passwords’ history, and apply it. Now you know that you can change the password policy and disable annoying password-related reminders like the password change reminder, the password expire reminder and many more. It is so easy to do that but should you need a help and you are customer of Dewlance.com VPS, you can contact us and we will offer help. How to automatically install/configure RocketChat using Dewlance?